River Grove Books, 9781938416828, 362pp. RUNNING A MARATHON IS TOUGH ENOUGH. IT'S EVEN HARDER TO OUTRUN DEATH. Erick Anderssen is the best-selling author of a series of how-to books for baby boomers seeking inner knowledge and strong thighs. Now Erick's next book is due, and his agent, for mysterious reasons, is pushing hard for him to write about the experience of training to run the GrandHotel Chicago Marathon-where his egotistical ex-wife is the race director. But before he can even begin work on the book, a shocking and violent death derails his research. Before he knows it, Erick is racing to uncover the secrets of the marathon-all while fending off assaults, bomb threats, international fraud, and strange disappearances. Along the way, Erick encounters a wide and fascinating cast of characters-fading Olympians, international singing sensations, aggressive Chicago cops, and a photographer who he believes is hiding a terrible secret-running steadily toward what may be a tragic outcome at the finish line. 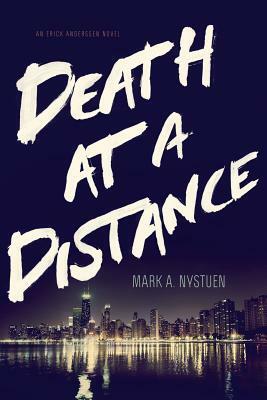 In his debut novel, "Death at a Distance," long-time Chicagoan Mark A. Nystuen, whose twelve-year leadership helped the LaSalle Bank Chicago Marathon become one of the largest participatory sporting events in the world, gives readers a vivid, local's-eye view of contemporary Chicago-its politics, its world-class food scene, and its history-as well as a behind-the-scenes look at the personality clashes, compromises, and conflicts involved in running-or running in-one of the largest marathons in the world. Mark A. Nystuen, in the second smartest thing he ever did, moved to Chicago in the late 1970s and promptly fell in love with the city. In a nearly thirty-year career with LaSalle Bank, one of the Midwest's largest financial institutions, Mark headed up the creation of the bank's sports marketing business. For more than a dozen years, those responsibilities included leading the organization, marketing, and operation of the LaSalle Bank Chicago Marathon. During that time, Mark and his team turned a mid-level race into one of the world's largest participatory events. Mark is now a principal at The Kineo Group, a Chicago-based strategic marketing, branding, and communications firm. In the smartest thing he ever did, he married Susan, and they have three amazing sons: Kevin, Connor, and Scott-Chicagoans all.